It is important to note that parking enforcement in Crystal City is robust and timely. 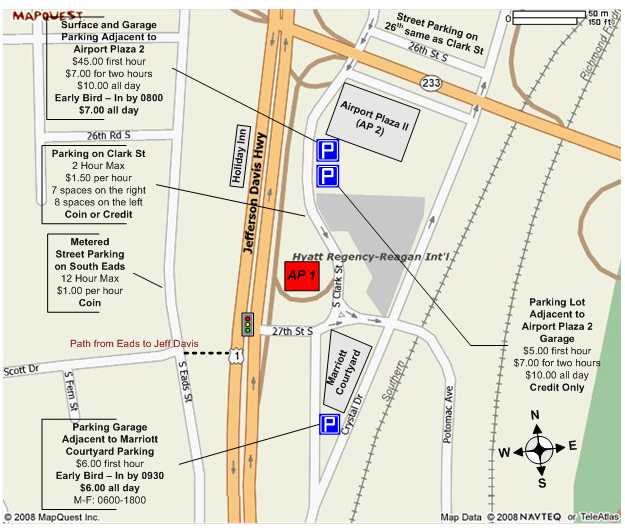 The Early Bird parking at the two parking garages is the best value for a workday event at the Hotel. Attendees: Uniform of the day is appropriate for all events EXCEPT the Banquet on Thursday evening. Banquet is Service Dress Blues with ribbons. Civilian attire for all events is business. Awardees: Service Dress Blue for Awards Luncheon & Banquet. Uniform of the day for all other events. Speakers: Service Dress Blues or equivilent. We highly encourge members of the media to attend the Symposium. Members of the media should register using the Registration link. Members of the media may attend the seminar sessions at no charge. We DO NOT provide free meals to media, however, if you wish to just cover either the Awards or the International Navies Lunch we do set up a media table at the back of the room. If you are ordering a meal, please pay the $20 rate as indicated on the Registration Form. A media room will be open Tuesday Afternoon to Thursday. Please pick up registration materials onsite at the Registration Area located in the hotel lobby. Atendees: An administrative fee of $20 will be charged if you cancel on/before Noon, January 9, 2019. After that time there are no refunds. Copyright © Surface Navy Association. All rights reserved.